"An early copy of Windows 8 leaked to the Internet this week and enthusiasts have been digging their way through the various new bits in Microsoft's next-generation operating system. Windows 8 build 7850.0.winmain_win8m1.100922-1508 contains a number of references to a brand new feature in Windows: Portable Workspaces. Microsoft will allow Enterprise customers to create USB storage driven copies of Windows. 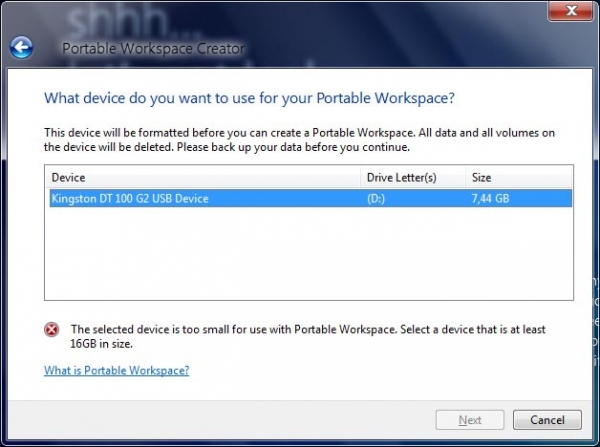 "Portable Workspace is a Windows feature that allows you to run Windows from a USB storage device," notes Microsoft in its description of the feature inside Windows 8. Users at mydigitallife unveiled the features inside 7850 and discovered that the feature requires at least 16GB of space." I've been wondering what sorts of new features would be a part of Windows 8, and it looks like we have something truly unique: the ability to create a bootable, portable version of Windows 8 that you can put on a 16 GB or bigger flash drive and do everything from. Lots of questions remain: what sort of functionality will you actually get given when you connect to a different PC you'll be using generic drivers for video, networking, etc.? Still, it's a neat idea with some interesting potential.